First flight 16 Sep 1952 by pilot Gale Moore. This was the largest diameter main rotor ever flown. 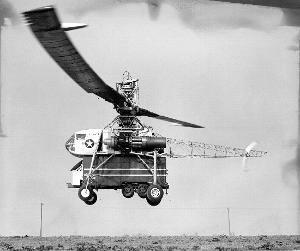 It employed a single main rotor with tip burning for rotor drive. Each blade had 4 burners located at trailing edge of the tip. The airfoil section of the blade was NACA 23018. 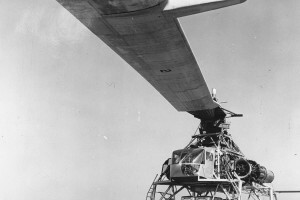 The rotor control system was unique in that the swashplate and the three massive hydraulic actuators were mounted above the rotor head. The XH-17 had a concentrated weight supported by a boom extending from the leading edge of each blade to avoid flutter. Tail rotor came from a Sikorsky S-55 (H-19). 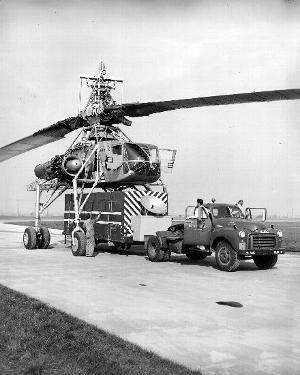 The tail rotor was needed for directional control and to balance the effects of friction in the main- rotor bearings and rotating seals. 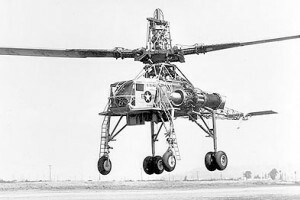 Resources related to the XH-17 Flying Crane, provided by the Vertical Flight Society. Resources related to the XH-17 Flying Crane, provided by public sources across the internet.